One of our favorite places to go for a few hours during the day is Disneyland or Disney California Adventures. We are only about a 20 minute drive from the theme parks so we can pop in there for a couple of hours on any given day. We usually stay for 3 hours max, depending on nap schedules. A few local mommy friends have passes too, so we have Disney days often. It’s nice to go with other moms who have young children so that the kids can play together and the moms can chat while we wait in line. We purchased the premium annual pass which gives us access to the park anytime with free parking, as well as up to 15% off dining and 20% off merchandise in select stores. It was pricey but after doing the math and knowing that we would go often, it was a better purchase than paying $99 for an adult ticket and only a 2-3 hr stay with a toddler (children under 3 are free). 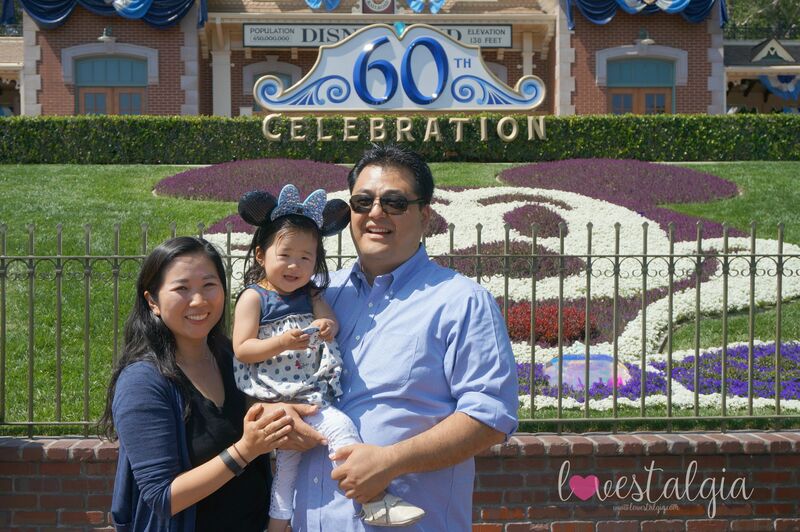 We have been going to the Disneyland Resorts since Little A was 18 months old. It was the perfect age for us to take her because she was able to enjoy the rides and attractions and could stay there for a longer time than when she was taking two naps a day. I’ve come up with some tips that I’ll share below that I’ve learned along the way. 1. Download a Disney app. The two that I use are Mousewait and the new Disneyland app. Mousewait is a free app on either iOS orAndroid that tells you how crowded the park is, wait times for attractions, showtimes, and so much more. There is also a paid version and the main difference between the two is that the paid version has less ads and more insider information and tips. The free one is more than sufficient. If the crowd index is at 50%, that means the park is only half full so it’s not too crowded. I was curious as to how many people would be at Disneyland if it was at 100% capacity and I read that it can be anywhere from 70,000 to 80,000 people! Disneyland came out with a new app in August for both iOs and Android where you can buy tickets, see wait times, locate Disney characters, see show times, and so much more! You can even link your annual pass and scan it at the gate but you will need your actual pass to get fast passes. 2. Parking. When I go, I don’t always park in the parking structure because I take a stroller with me. When you park in the structure, you have to take the tram and when you take the tram, you have to take your child out of the stroller. It’s always a struggle to get Little A in and out of the stroller so when I don’t want to fight that battle, I tend to park at Downtown Disney. The parking is free for the first 3 hours and you can get an additional 2 hours free with validation. Another option would be to walk from the parking structure to the entrance way to Disneyland, which is about a short half mile walk. But if your child doesn’t fuss when they have to get in and out of the stroller, try to sit in either the first or last car of the tram so that you don’t have to fold your stroller. 3. Pack a lot of snacks or bring your own food. I tend to overpack my backpack even though I will only be at either park for a couple of hours. This is because sometimes the lines are pretty long, even for the toddler-friendly rides. Having a variety of snacks on hand helps minimize tantrums and meltdowns. Plus, I don’t have to waste time standing in line to buy food for three times the price. I also sometimes go through a drive thru and grab a meal for us. I try not to buy the food there but we do love their popcorn. You can get FREE iced water from any of the snack or counter service restaurants that serve soda, so I don’t bring heavy water bottles with me anymore. We did splurge on a character dining experience at Goofy’s Kitchen which was well worth it. 4. Have a plan. Figure out what you want to do that day and what you want to ride or see. We don’t try to do everything in one day. Of course we have the luxury of living so close and being able to go whenever we want, but I still plan out the day so that there’s minimal stress for everyone involved. For families with small children who still nap, it’s better to get them to nap in the stroller rather than skip it. 5. Watch a show. In all the years I’ve been to Disneyland prior to having Little A, I don’t recall ever seeing a show other than Aladdin at California Adventures. I wasn’t sure if she would even enjoy watching one or how she would do sitting and paying attention for so long, but to my surprise she was mesmerized and watched a 25 minute show with just a few squiggles and wiggles! Two of our favorite shows to watch are Disney Junior Live on Stage at California Adventures and Mickey and the Magical Map at Fantasyland Theater at Disneyland, which is located right across from It’s a Small World. They have her favorite characters dancing and singing which keeps her entertained and engaged. I find that this is also a wonderful way to decompress from the crowds and heat. 6. Go earlier in the day. I try to visit the parks in the morning and not in the afternoon. I feel like it gets busier around 11am until dinner time. But now that it’s summer and with the 60th Anniversary Diamond Celebration, it will probably be busy for a long time. If you are not local and plan to stay at one of the three Disneyland hotel properties, you are allowed to enter the park early on select days for Extra Magic Hour. If you buy a 3+ day park hopper, you are allowed to enter the park early once on select days for Magic Morning Early Admission. You can accomplish quite a lot in that extra hour when lines are short and crowds are minimal. I wish they had this for pass holders! 7. Rent a stroller. Disneyland offers stroller rentals for those that don’t want to deal with the hassle of traveling with a stroller or didn’t bring one. It’s $15 to rent one or $25 to rent two for the day, and they look really comfortable and clean. You can rent it just outside the Disneyland Park Main Entrance, next to the Kennel. 8. Use the Baby Care Center for diaper changes or if you run out of supplies. The Baby Care Center is located at the end of Main Street next to First Aid at Disneyland and next to the Ghiradelli Shop in Pacific Wharf. If you run out of diapers, formula, wipes or other baby related items, you can purchase them there. You can also warm up bottles or nurse in private. They even have “lost & found” stickers you can put on your child with their name and phone number in case they get separated from you during your visit at the park. This is the location where they bring children who get lost. 9. Use the Rider Swap Passes on some of the popular rides. This is a program for some of the bigger rides and attractions which seems like it would be so helpful when you have children who want to ride a ride and others who can’t. You use this when Parent1 goes on a ride with a child while Parent2 is waiting with the child that can’t go on the ride due to height requirement or whatever other reason. Parent1 can ask the cast member for the Rider Switch Pass which will allow Parent2 to bypass the line so that they can ride that ride with up to 2 additional companions without having to wait in a line again. You can combine it with Fastpass so that your wait time is less for Parent1. We haven’t used this yet but how great does that sound for families who have multi-aged kids. 10. Get your silhouettes done on Main Street. 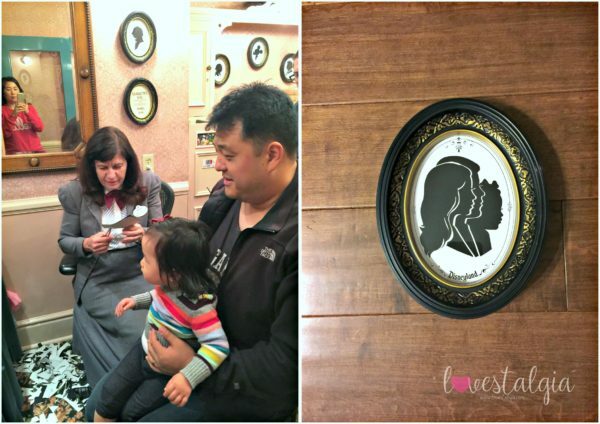 If you have time, you should definitely get your silhouettes done at the Silhouette Studio on Main Street next to the Crystal Art store. One of my friends told me about this and I am so glad we got one made! It only takes a few minutes and you get a wonderful keepsake to treasure for years to come! We got one done of just Little A and one of our whole family. We have gone on some of these, but not all of them. Little A doesn’t like rides that are dark so we tend to avoid them. She also has some favorites that she can ride over and over again. I’ve found that even if she didn’t like a ride, she might like it the next time and vice versa. As you can see, we love Disneyland! 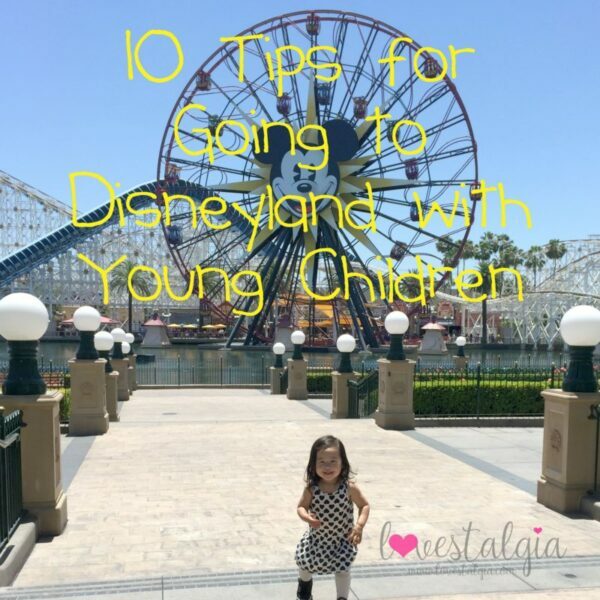 Do you have any tips for a trip to Disneyland?